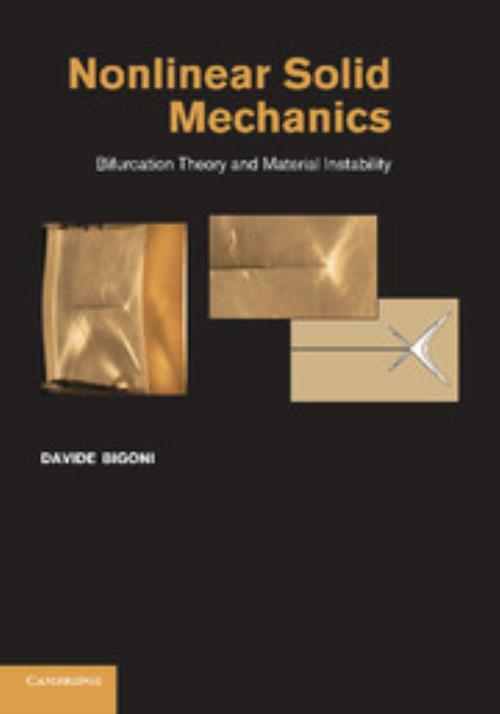 This book covers solid mechanics for non-linear elastic and elastoplastic materials, describing the behaviour of ductile material subject to extreme mechanical loading and its eventual failure. The book highlights constitutive features to describe the behaviour of frictional materials such as geological media. On the basis of this theory, including large strain and inelastic behaviours, bifurcation and instability are developed with a special focus on the modelling of the emergence of local instabilities such as shear band formation and flutter of a continuum. The former is regarded as a precursor of fracture, while the latter is typical of granular materials. The treatment is complemented with qualitative experiments, illustrations from everyday life and simple examples taken from structural mechanics. 16. A perturbative approach to material instability. Davide Bigoni Professor of Solid and Structural Mechanics, Università degli Studi di Trento, Italy. Davide Bigoni is Professor of Solid and Structural Mechanics at the University of Trento, Italy, where he has been head of the Department of Mechanical and Structural Engineering for the past ten years. He was honored as a Euromech Fellow of the European Mechanics Society. He is co-editor of the Journal of Mechanics of Materials and Structures (an international journal founded by C. R. Steele) and is associate editor of Mechanics Research Communications. He co-edited, with Deseri Luca, Recent Progress in the Mechanics of Defects (2011).